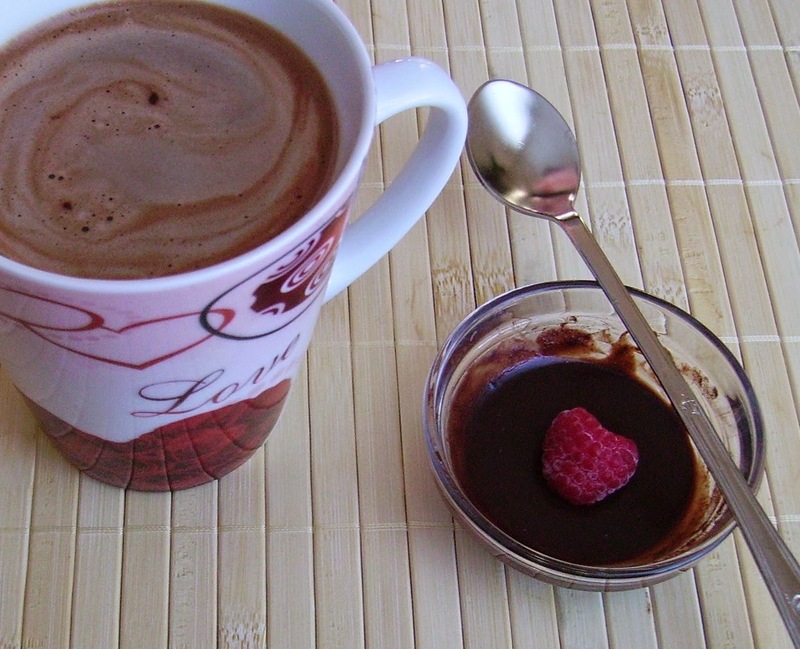 If you are at least a little like me, you love fruit, coffee and chocolate. And you don't love artificial flavouring. I know, I know, there are such things like syrups claiming to be naturally flavoured. But let's face it, if a product label says "natural flavour" this does not necessarily mean that the flavour comes from the product of which it tastes. It just says it is made from some natural base, like, say, wood shavings. Natural raspberry flavour is natural because the wood from which it is made is a natural product. Of course the labels don't say how exactly they make the wood give away raspberry flavour. Maybe these "natural flavourings" do no harm at all. I don't know it, and most probably nobody really knows. But I don't think our body is happy to be fooled with a flavour without getting the real thing. Flavour is associated with the nutrients a fruit contains, and if we are fond of raspberry flavour, it's for good reason: Raspberries are low in sugar and starches but full of dietary fibre, vitamin C, manganese and lots of phytochemicals like anthocyanic pigments, ellagic acid, quercetin, gallic acid, cyanidins and other stuff that makes them extremely valuable for keeping us healthy. Preventing cancer and other nasty things. So why not use the real thing to make a decadent treat? Yeah, it's easier to just squeeze chocolate and raspberry syrup from a bottle into my cup, fill in some coffee and steamed milk and voilà. But honestly, we do spend such a lot of time doing unimportant things, why not sacrifice a bit of our time to pamper ourselves with something decadent that actually is healthy? We only save all this time with ready made products for investing it later into illness. Bad deal. You can actually have all the benefits of your raspberries without boiling them to death in order to get syrup. Pass the raspberries through a sieve into a small bowl. 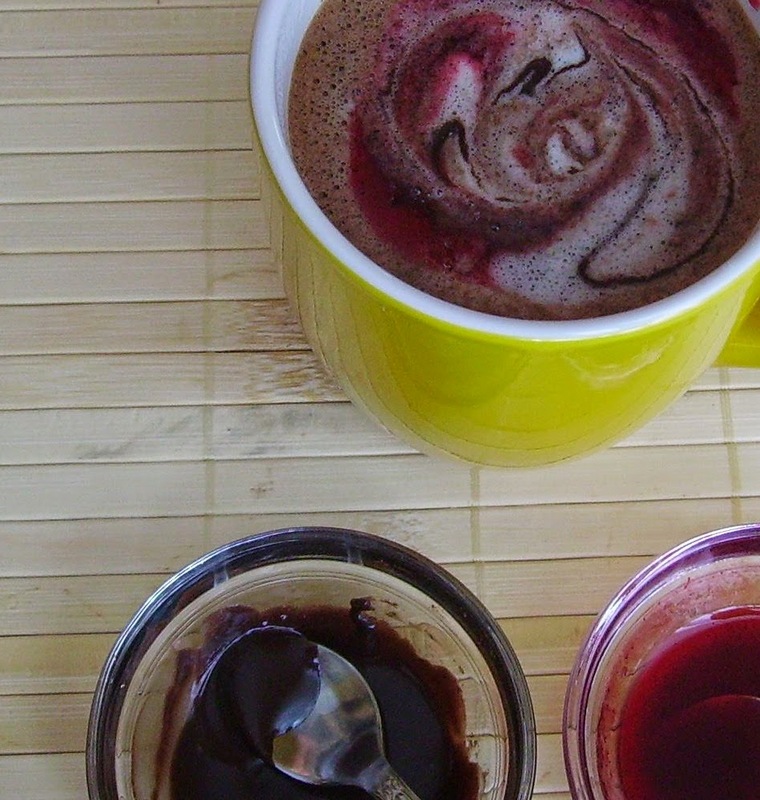 Add cocoa powder and syrup, until it suits your taste. Voilà. Raspberry-chocolate goodness. All natural. If you like it really sweet but don't want all the sugar (natural syrups are still sugar), you can also add some powdered erythritol or stevia, if you like it. It won't stay raw when you add hot coffee and steamed milk, but at least it's not boiled to death, and I'm quite sure that some of the nutrients will survive. 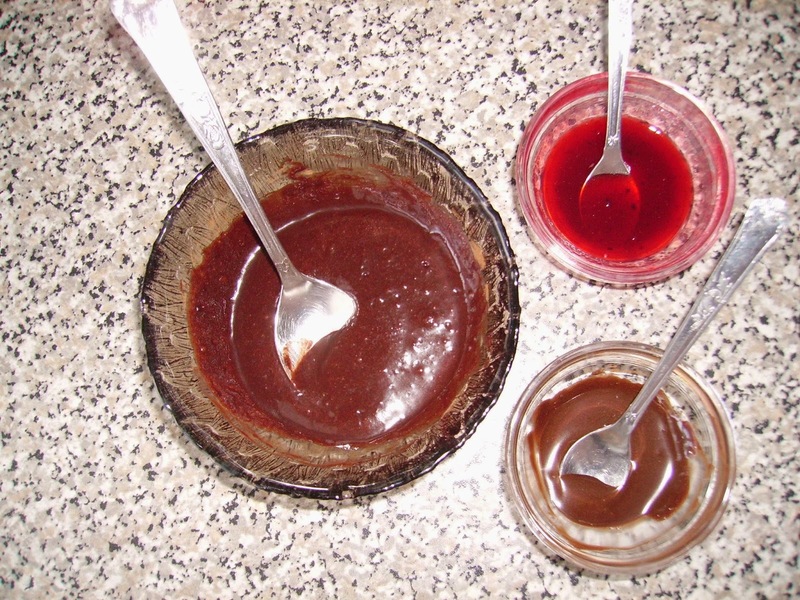 Combine raspberry mash and syrup and cocoa powder and syrup separately and reserve for topping. 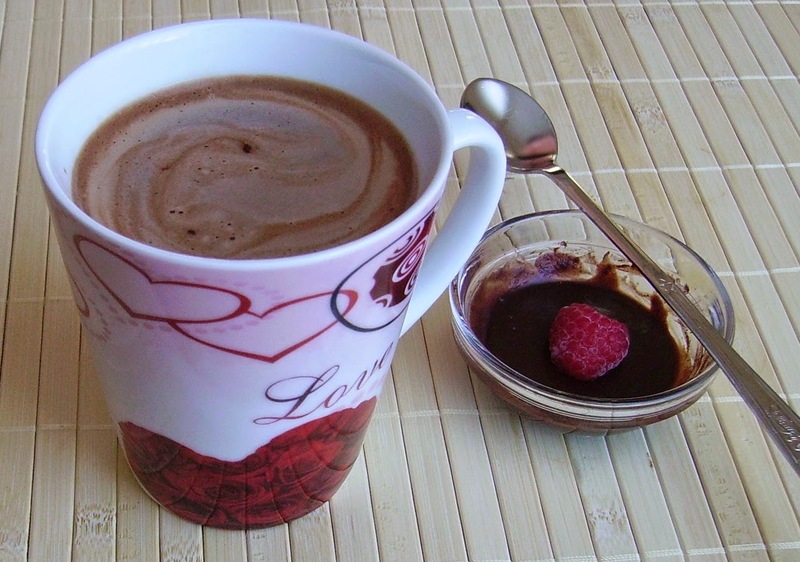 Fill your chocolate-raspberry syrup into a mug, add hot brewed coffee, stir well, add frothed or steamed or just hot milk and top with raspberry and chocolate syrup. The little black sprinkles are vanilla which I added to the soy milk. You will realize that my photos don't look as artistic as the usual pictures you see from flavoured mochas of famous coffee shops. Of course I could pipe whipped cream on top of my mocha. I could whip coconut cream, and it would look pretty and still be all natural and even vegan. But in the first place, I don't want additional cream on top of my mocha, and secondly - I prefer to invest my time into making healthy syrup, not into styling my drink like a diva. The mocha in the Love-mug has been made with rice milk which can't be frothed at all. Looks boring, but tastes great. 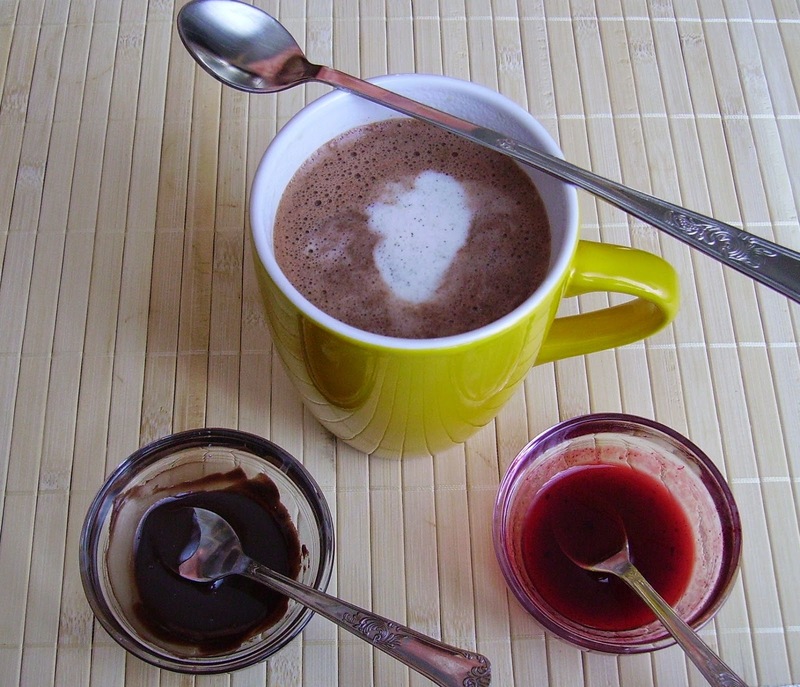 The mocha in the yellow mug has been made with soy milk which could be frothed moderately well. There are brands which can be frothed even better than cow's milk, but not this one. I don't mind. It tastes great. Wow Mia, was this ever good. 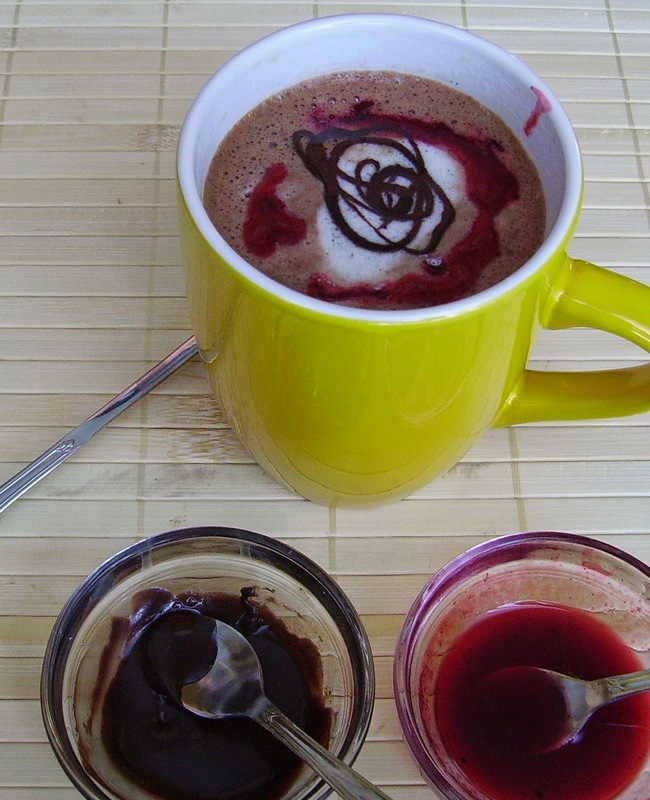 You are so right, it tastes so much better when you use homemade raspberry/chocolate sauce. The sauce was quick and easy to make and tasted wonderful. I used a strong french roast coffee and 1% milk, unfortunately the milks foam collapsed. It didn't look pretty but boy did it taste good. Thank you for sharing a recipe, that I will make again often. Made for Beverage Anyone? Tag Game. 2015.